Crayola, one of the biggest names in colouring and art supplies, celebrates it's 100th anniversary this year. To celebrate, they have launched a sophisticated range of adult stationery. Adult colouring has seen a huge rise in popularity over the last few months and so this has been perfectly timed. There is something very therapeutic about sitting and concentrating only on creating a colourful pattern on paper. I personally love to take some time out and colour in when I have had a stressful day and need to take my mind off things. The new collection consists of a 12 pack of 24-colour dual sided pencils (RRP £4.99); 50 pack of pencils (RRP £11.49) and 12 delicate fine line markers for intricate colouring (RRP £4.49). 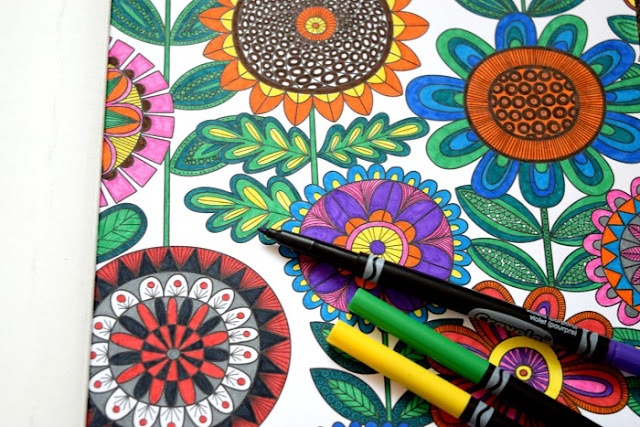 They have also launched their own range of adult colouring books which feature beautiful patterns and designs created by artists at Hallmark. 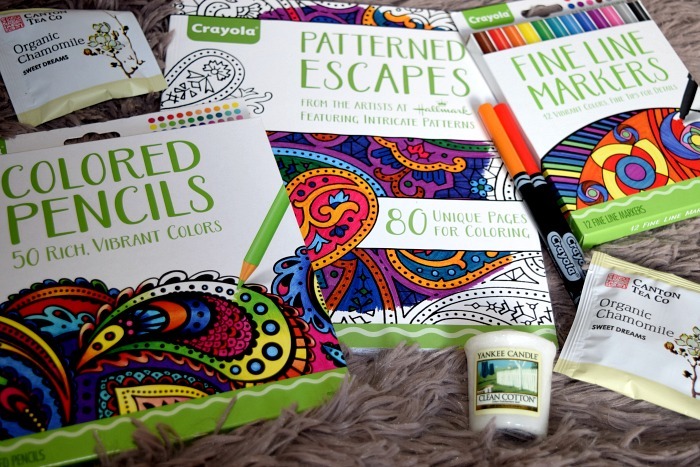 Crayola sent me their 'Patterned Escapes' colouring book along with a pack of 12 fine liner pens and a pack of 50 colouring pencils for me to relax and embrace my creative side! I have really enjoyed spending my evenings colouring. The book has 80 unique pages to colour in. I love that there is just one picture on each piece of paper rather than back to back pictures where you have the risk of pens leaking through. Also there is perforated line down each page so you can remove pages to share with friends or kiddies. The fine liner pens are brilliant. The quality is great, I do wish there were more lighter colours as most of them are quite dark but I can't fault the quality of the pens at all. I think they look really good too. The colours all go really well together. I would love to see them bring out a pastel range or something to add to the collection. I am so impressed with the pack of 50 colouring pencils. I love having 50 totally different shades to use. I have had so much fun reliving my GCSE art days, practising blending the colours together. There are so many lovely colours that you don't quite no where to start! There are even a few metallic colours which really do look great. The pencils are all great quality, you can press down hard without breaking the lead, but to be honest I have found you don't really need to press down hard unless you want to use them to make a light/dark effect. I genuinely think they are the best crayons I have ever used thanks to the quality and range of shades. Overall, I really like the Crayola adult colouring range and really hope they decide to expand it! I would love more of their fine liners in different colours. The book is great and the designs are so intricate that each page can take hours to colour in. It will definitely take me a long while to finish it but I will definitely buy another when it is finished. 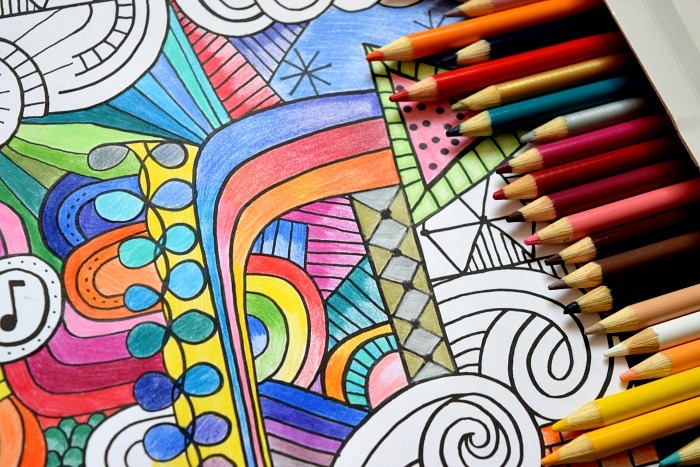 Coloring can be very relaxing for many. My niece is an avid arty type person. I bought her some of these coloring books for Christmas. I do like the effect you've got with the pencils and there is a lovely range of colours. Great review! Great for long journeys keeping you calm and passing time.